True to its moniker, the Baby Boom generation is still making noise. This time, it’s in the local and national labor market. If you listen closely, the rumble you hear is the tectonic shift of this massive generation – which makes up about 30 percent of today’s workforce – entering retirement. Nationwide, 10,000 Boomers turn 65 every single day. This cascade is turning the rumble into a roar, creating challenges and opportunities for workers and employers alike. “If you just look at the raw number of working-age adults, there’s going to be a huge supply-demand issue that employers are going to be experiencing, and some of them are experiencing now,” explains Jennifer Owen, director of the Aging & Disability Resource Center of Eau Claire County. Owen says nearly one in four Eau Claire County residents are 60 years of age or older – and the county’s demographics actually skew younger than most other parts of Wisconsin because of the concentration of college students here. By 2050, Owen says, the share of the county population 65 and older will have grown 75 percent, while the share of people 25 to 54 will have grown only 2 percent. On one hand, the aftermath of this demographic tidal wave should offer some smooth sailing for Millenials, many of whom have struggled to find jobs in recent years. (According to nonpartisan advocacy group Generation Opportunity, the unemployment rate for 18- to 29-year-olds was 13.8 percent in April when people who had given up looking for work were included.) Aging Boomers will leave many jobs vacant, while other jobs will be created to care for the graying population. On the other hand, vacancies are often – and will continue to be – in higher-level jobs requiring skills that took Baby Boomers years to gain. Owen, who recently gave a presentation about the aging workforce sponsored by the Eau Claire Area Economic Development Corp., says employers need several strategies to deal with the demographic shift and the resulting conflicts. First, employers can offer incentives and flexibility to older workers to entice them to stay on the job past retirement age, she says. Secondly, employers need to encourage education and mentorship for younger workers who will fill the jobs left open by retiring Boomers. While businesses should have been planning for this eventuality five to 10 years ago, Hodek says, the day of reckoning was delayed by the Great Recession: Many Baby Boomers who would have otherwise retired – the first wave of them hit 65 in 2011 – stayed at work to rebuild their shrunken retirement accounts. Now, however, more of them are retiring, which means the size of the labor market is barely growing or is standing still in some Wisconsin counties. So what can job hunters – especially those just entering the job market – do to take advantage of the situation? Hodek advises that these people avoid gaps in their résumés, which can be a turn-off for potential employers. Even if volunteer work or unpaid internships are their only options, unemployed or underemployed workers should keep their resumes full, he says. Younger workers can also keep an eye on which professions have the most openings in the Chippewa Valley; such data tracked annually by the Regional Skills Gap Initiative (see accompanying chart). While she agrees that the aging workforce should present big opportunities for young workers, Owen of the Aging & Disability Resource Center notes that this isn’t always the case – at least anecdotally. Owen surmises this may be because the kinds of jobs created because of an aging population – in home health care, for example – are demanding professions that don’t pay particularly well and thus may not be attractive to many younger workers. One the whole, however, the combination of Baby Boomers leaving the job market and a growing economy means the outlook is generally positive for job-seekers, especially those just getting out of school: the National Association of Colleges and Employers says its hiring projection for job-hunters with bachelor’s degrees grew 9.6 percent over last year. 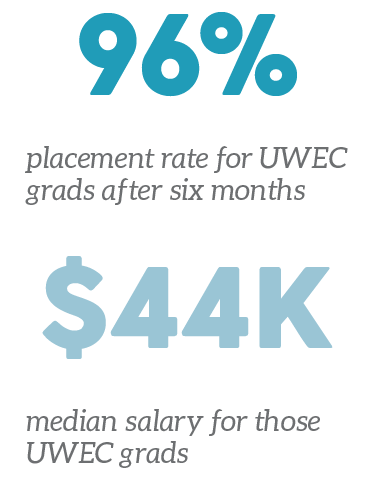 Meanwhile, recent grads of UW-Eau Claire have a 96 percent placement rate and a median salary of $43,854, says Staci Heidtke, UWEC’s associate director of Career Services.